Saint Giles, whose name has been held in great veneration for many centuries in France and England, was born in the year 640 in Athens, and was of noble extraction. Certain remarkable works of medicine and poetry are attributed to him, but his knowledge was primarily that of the Saints. When as a young man he met a poor beggar who was sick and half-naked, he was moved with compassion and gave him his splendid tunic; the moment the beggar put it on, he found himself in perfect health. By this miracle, Giles understood how pleasing almsgiving is to God, and shortly afterwards, he distributed all his goods to the poor and entered upon a life of poverty, suffering and humility. But Jesus Christ did not let Himself be outdone in generosity, and soon miracles multiplied so greatly in his wake, that the admiration of the world surrounded him. It became impossible for him to profit in his own country from obscurity and retirement, which he desired above all else. He therefore went to France and chose for his hermitage the open spaces of the south, near the mouth of the Rhone. Soon he was known there, too, by the miracles his kindness brought down from heaven. 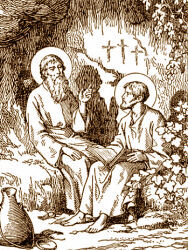 He moved again, and this time Providence brought him near Saint Veredemus, a hermit of Greek origin like himself; then the two rejoiced in a common life of the love of God. For two years they remained together, until the invasion of their solitude caused Giles to migrate to a deep forest of southeastern France, in the diocese of Nimes. He passed many years in this intense solitude, living on wild herbs or roots and clear water, and conversing only with God. He was nourished there by a doe of the forest. One day, being pursued by Visigoths hunting in the forests, she fled for refuge to the Saint and lay down at his feet. Moved to tears, he prayed God to spare the life of the innocent animal. An arrow the hunters had sent in her direction came and lodged in his hand, making a wound which would never heal. When the hunters found the animal there and saw the bleeding wound of the gentle hermit, they begged his pardon on their knees, and the chase was ended. The Visigoth king, hearing of this, came to visit this holy hermit, accompanied by the bishop, who afterwards ordained Giles a priest. The reputation of the sanctity of Saint Giles increased constantly by his many miracles, which rendered his name famous throughout France. He was highly esteemed by the pious king, but could not be prevailed upon to leave his solitude. He accepted several disciples, however, and established excellent discipline in the monastery which the king built for them. Destroyed during the invasions of the Moslems who had entered Spain, it was rebuilt during the lifetime of the founder and his disciples, when they returned after the torment. In succeeding ages, it became a flourishing abbey of the Benedictine Order, which bore his name. It is through many tribulations that we must enter the kingdom of God.